Linear Gas Fireplaces by Fireplace Xtrordinair have a sleek, contemporary look and a high output of heat. They are available in 3, 4 and 5 foot lengths with 15” glass height. The structure combines a row of dancing flames with built-in fans to distribute warmth. Equipped with under-lighting, the fireplace sets an atmosphere whether fuel is burning or not. Choose from four fireback options including black painted, black porcelain, ledgestone and stainless steel. The versatility of sizes and features combined with your choice of traditional gas log setting or contemporary fire glass make this fireplace a wonderful choice for any room size or architectural style. Optional Driftwood or Driftwood and Stone Kit Fyre-Art. 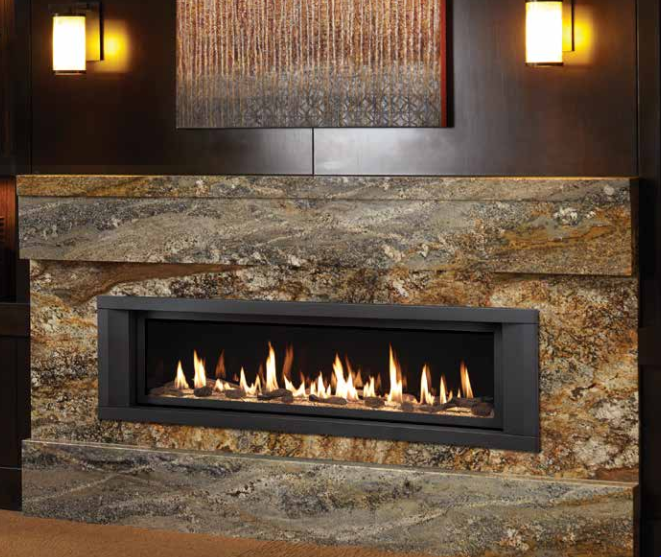 Choose from Gas Log Settings or Contemporary Fireglass. Fireglass in platinum, bronze and cobalt blue colors.